It’s actually quite easy to recover deleted files using a free file recovery program such as Wise Data Recovery. But did you know that files can even be recovered from flash drives that have been formatted? Well, it’s true, and it’s just as easy as recovering files that have been “deleted”. 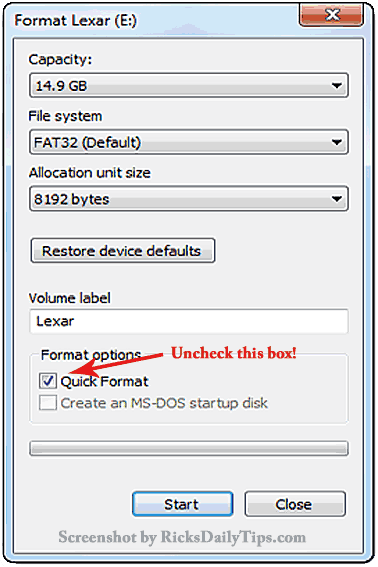 If you format your drives using the “Quick Format” option, the files on the drive won’t actually be over-written as the drive is formatted. Instead, only the “pointers” to the files are wiped out, leaving the files themselves intact and easily recoverable. This is usually not a problem, but if some of the files on a formatted drive are sensitive in nature, anyone at all could use a file recovery program to retrieve them. Bottom line: Format your flash drives without the “Quick Format” option and you’ll be able to rest assured that your files cannot be recovered by someone else.